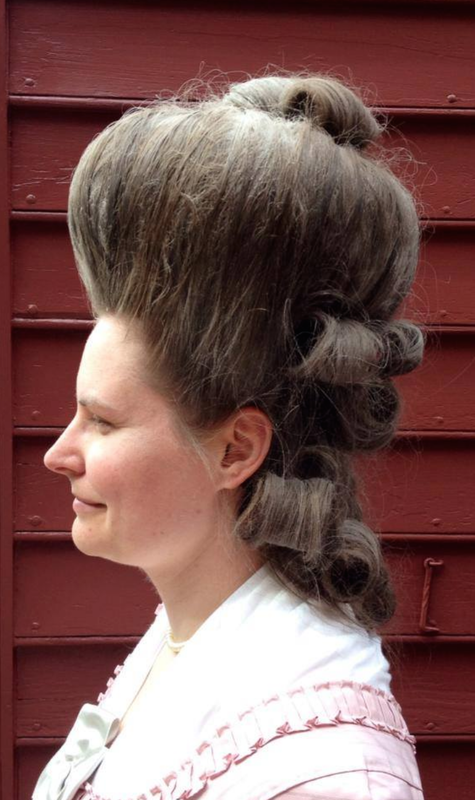 Considering the towering hairstyles worn by women in the 1770s, the question that inevitably comes to mind is "how did they do it?" 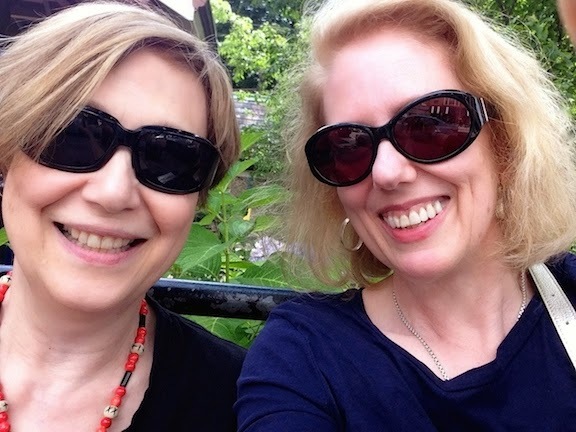 For the answer, I turned to two of our friends from Colonial Williamsburg, the manuta-maker's apprentices of the Margaret Hunter shop: Abby Cox and Sarah Woodyard. First, forget 21st notions of bouncy, squeaky-clean hair. 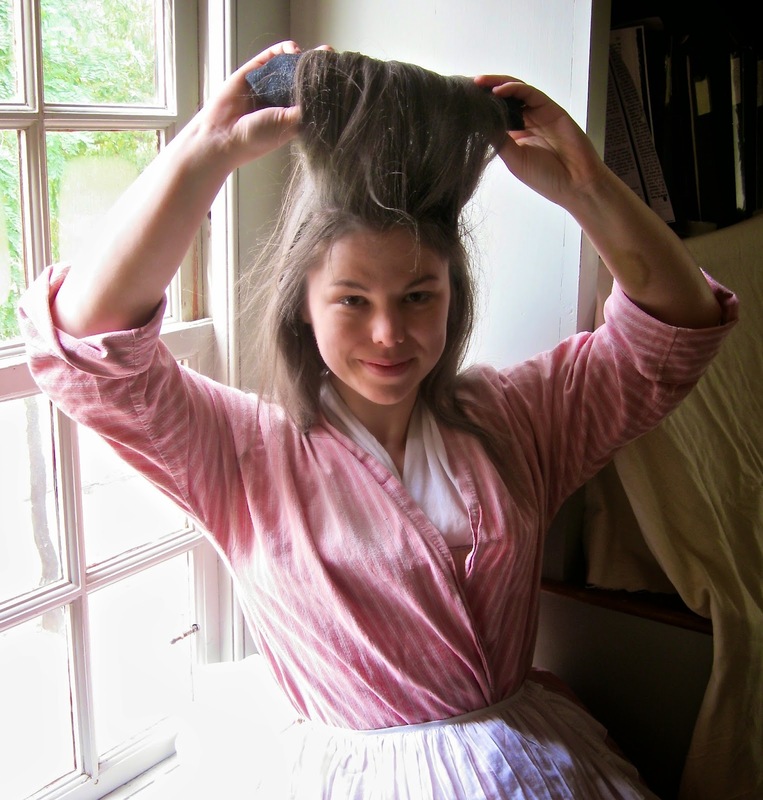 Eighteenth-century women did not scrub their hair clean, so much as cleanse it. Instead of daily lathering of soap and water (which can damage hair), they worked pomatum into the hair with their fingers, added powder, and then brushed and combed vigorously. The pomatum could have been made at home or purchased, and consisted of animal fat plus fragrance. The powder would have included some sort of finely-ground starch, with ground sheep or beef bones and ground orris-root for a light floral scent. Following an 18th c. recipe, Abby made pomatum of mutton fat and pig's lard with essence of lemon and clove oil, to be kept in a jar. I can report that this mixture smelled absolutely, delightfully spicy – plus, as Abby noted, clove oil is a natural flea and tick repellent. The recipe for her hair powder came from The Toilet of Flora, first published in 1772 (and here online.) Think of the pomatum as a rich, deep conditioner applied as a kind of scalp massage, followed by the powder as dry shampoo. This treatment is hardly limited to the Georgians, either. Indian women, known for their beautiful, long hair, have long followed a similar cleansing regimen of oiling and combing. This process was done frequently, too. 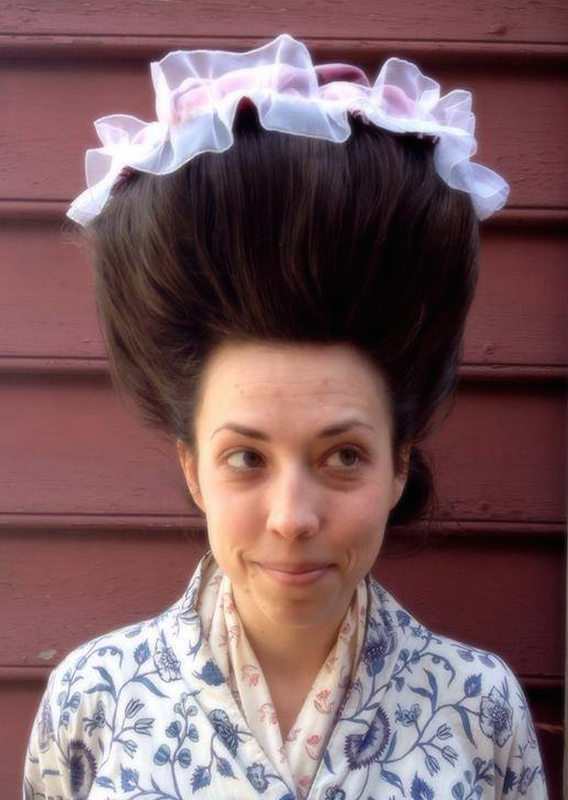 No matter how elaborate the style, Georgian women always took their hair down at night and combed it out. For many women, this was likely a relaxing, aromatherapeutic ritual for the end of the day - although there were no doubt some lazy, slovenly hussies who didn't, giving rise to the myths about maggots. Hair that had been treated like this made styling much easier, just as modern hairdressers rely on powdered dry shampoo to add texture and body before attempting up-dos. More powder was dusted on before styling to achieve the fashionable matte, "dusty" look of powder and to make dark hair paler. Unlike the beehives of the 1950's-60's, Georgian women did not tease their hair, but added extra volume with padded forms called rollers and cushions, middle right. Think of them as the 18th c. answer to Bumpits. Sewn of wool cloth to match the wearer's hair, these were shaped pillows stuffed lightly with down or sheep's wool. The hair was wrapped around, (that's Abby demonstrating, middle left), or pulled through the forms, and smoothed and pinned (with u-shaped hairpins) into the desired shape. Side curls could be rolled and pinned into place, and extra touches could include braids or false curls. (Wearing a more elaborate style, above left, is the third of the shop's summer interns, Rebecca Starkins, a PhD candidate at N.Y.U. in English literature.) There was no mousse, gel, or hairspray; the pomatum and the powder offered the necessary staying-power. How long would all this take a busy 18th c. apprentice before she appeared for work? If Abby and Sarah are any indication, not long at all. They accomplished these elaborate styles in about ten to fifteen minutes, or less time than many modern young women spend with blow-dryers and flat-irons. 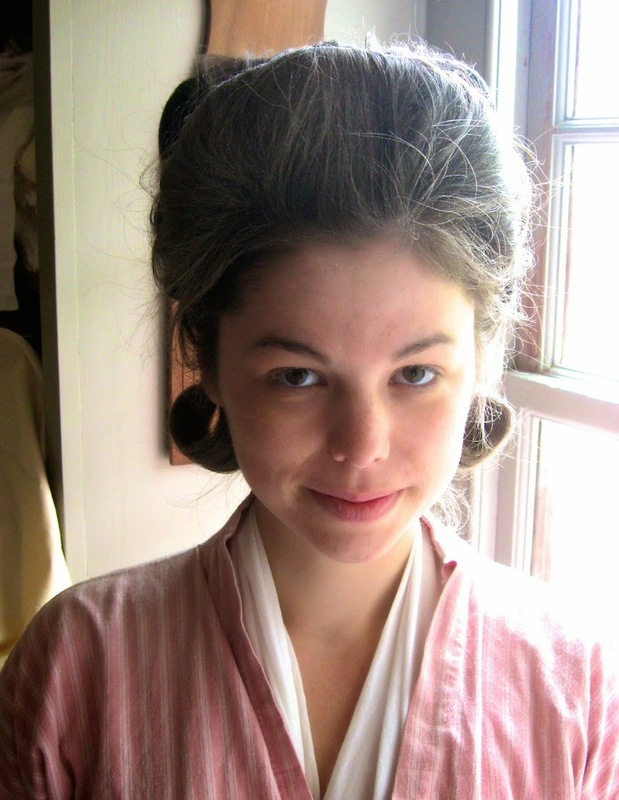 A skilled 18th c. professional hairdresser would have been able to perform the basics in less time, plus construct a more towering edifice of hair complete with flowers, ribbons, and strands of pearls. More impressive still is the fact that both Abby and Sarah have both given up modern hair care products altogether, and "practice what they preach" with pomatum and powder. When they go visit their (modern) hairdressers for a cut, they're greeted with amazement, for their hair is healthy, strong, and thick - and, they swear, in better condition than ever. Hmm...perhaps the old ways ARE the best. For the record: The length of Abby's hair is just below her shoulders, Sarah's is to the middle of her back, and Rebecca's is to her waist. Many thanks to them all! 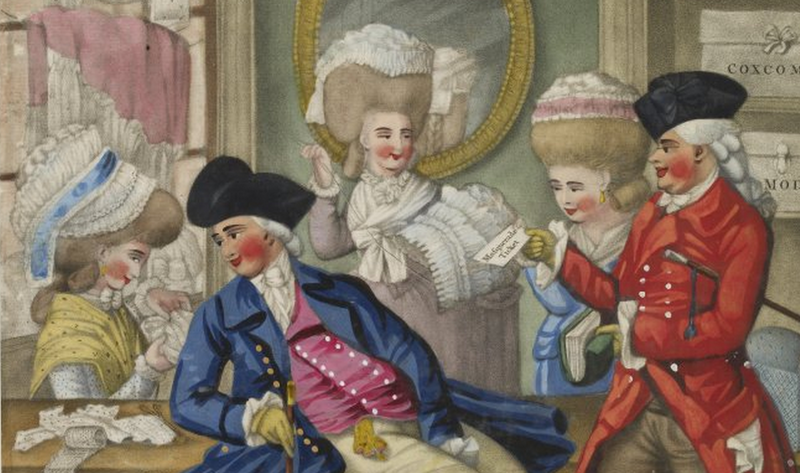 Upper right: detail, A Morning Ramble, or - The Milliners' Shop, published by Carington Bowles, 1782. The British Museum. Photographs by the Margaret Hunter Shop and Susan Holloway Scott. Very impressive! being prone to earache, I was inclined to use talc to cleanse my hair in the very cold winters of the late 70s and I have to say I never was that impressed by the result - what I was missing was obviously the pomatum! I might give it a try this winter, I have hair to the small of my back and it's the devil's own work to get it dry in winter in a house without central heating. I'll post how it goes.... first to make pomatum! Very interesting. All the books I have on the subject mentioned how the ladies left their hair up for a week or more. INteresting to discover it isn't so. 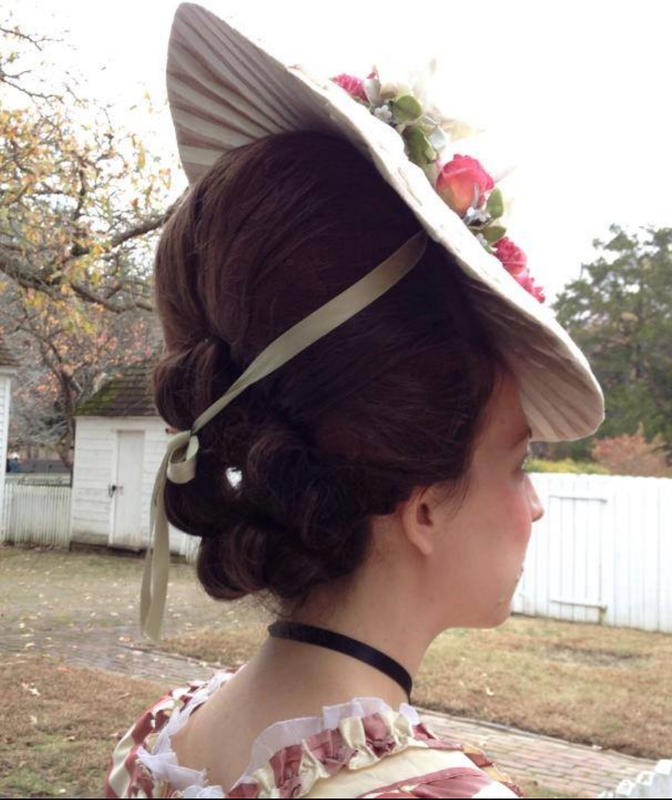 A century later =-- well nearly so, a woman left a friend a linen hair twist or perhaps its a hair linen twist in 1853. Cunninigton's description of hair of that day as well as Hair 400o years history mention twists frequently when discussing the styles if the 1850's . Do you have any idea what a hair linen twist or linen hair twist might have been? Are the rollers and cushions available for purchase anywhere? I'm just using a wiglet at the moment to get the necessary lift. Makes me want to grow my hair out, though it never gets to my shoulders. I suppose you could do this on a human hair wig, though, then blend you own hair into the front? There are period references to ratting the hair ("frizzling") -- the book Evelina, for example, the title character complains about having her first professional hairdressing and that she doesn't know how she'll be able to comb out all the ratting -- but I do think the more elaborate 'dos did require supplemental padding. Nancy, I'd read that, too. Older costume books play that up, along with how people were generally unclean, which they weren't. It's good to see that modern historians are going back to original sources rather than relying on what has been written & misunderstood in the intervening 200+ years. I'm afraid I don't have an answer for the linen hair twist - that's a bit beyond my time period. Anybody else know? Lauren, I guess you could do this with a wig. Dont' know why you couldn't. Gibson Glamor, My guess is that "frizzling" is used to create a different style coming in a bit later - or right about the time in the late 1770s when Evelina was published. Sometimes called a "hedgehog", the hair was cut shorter, and teased into a full, curly style around the face, almost like a dandelion. And I bet they WERE hard to comb out! Would this one also be made in a similar way? It looks more like what I'm trying to achieve. Also, any tips for long hair? My hair is hip length and I find many of the techniques seem more difficult on hair this long (like rolling the "rat"). Thank you! You look amazing! Great work! Amazing! I would love to know Sarah and Abby's process - that is, how they are using the pomatum and powder. Perhaps a guest post from them? I'd like to say thanks, this has really caught my attention. So many websites on history are deadly-dry. This really does focus on how people really lived. As there seem to be a lot of men on most history forums, it's no wonder that personal hygiene has been ignored. I don't mean there's a lot of smelly armpits among historians (how would I know?). But the niceties and pleasantries of historical life has never featured much in discussions. This is a refreshing change, in more than once sense! This is so cool! I have hair just long enough to pull into a ponytail so I use a little sock bun thing to add fullness to a bun. It's so neat to think that we're still using variations of these techniques. Thanks for researching this! Unknown - Yes, Monica (the apprentice in pink in the photo in your link) is wearing a roller - a thick, sausage-shaped pillow - in the front of her hair. the back was twisted and braided and pinned up. I wish I had a photo showing it! Her hair was about 3" shy of her waist, so not so long as yours. Alas, I don't have any specific hints for long hair - though I know the CW women all wish theirs were longer, so I'm guessing they would consider super-long hair simply more to work with. Terese - Abby is planning to write up her findings for a paper for a conference in the future. I'll keep you posted! I second what Terese said! I'm particularly interested in their day-to-day routine for when they _aren't_ at CW! Are we talking daily pomade+powder+weekly wash (with bar soap or a modern equivalent) or weekly hot water wash + daily pomade+powder? Clearly daily brushing, but I'm very curious how/if hair washing is incorporated! I have read somewhere that the hair combed or brushed out was kept and rolled inot rats for padding - was this done in this period? Anonymous, I believe that's a 19th c. fashion, not 18thc. I'll freely admit that I don't know much about later hair - anyone else out there have more information? I'm also very interested in Sarah and Abby's process. It might be that wool could be bought from these people http://www.zwool.com/buy-wool-online/ I bought a (so comfortable!) mattress pad filled with wool from them a few months ago and they were very helpful about making a non-standard size. I've actually found a reference to folding and frizzling hair from 1682 Massachusetts - some wealthier girls and local maids were charged with folding and frizzling their hair, but they didn't show up to court. Can anyone explain why people in this era wanted a dusty, lighter look to their hair? What did light colored hair mean to them? For example, I think the 1920s bob "read" as fast, moving, untrammeled. What values did powdered hair represent? To me, the mess of the powder would make it too unpleasant to contemplate -- obviously, the women of the era did not agree. If you are suffering from the hair loss problem and want the best solution then you can easily get the best treatment only from Profile Hair Transplant clinic. We provide the best hair transplant surgery in India.